On a lark this summer I decided to write up my memories from when Grace was born. I didn't intend to publish it at the time, but, hey! I have a blog now. This is a fairly complete telling so if that kind of thing bothers you, avert your eyes. Pour a drink of some sort because this is long. 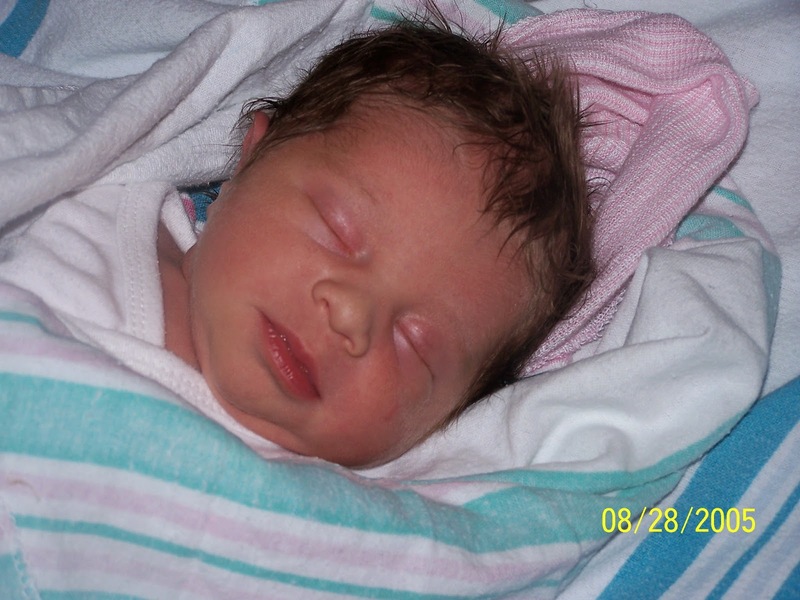 Saturday, August 27, 2005, began just like any other day of recent memory. I was over 38 weeks pregnant but not terribly uncomfortable. I was not having any contractions that I would note as painful or even remarkable. The only thing that sticks out in my mind is that I ordered some online pictures from a wedding which I had been meaning to order for weeks. In the previous week, I had finally opened, detagged, and washed the baby stuff. Little did I know that would be the sum total of my nesting. My due date was Labor Day, but I wasn’t really expecting labor even then. My mother’s pregnancy history was to go 41-42 weeks. I was born at 42.0 weeks and I expected to be overdue as well. My last OB appointment had my cervix at a one which I knew didn’t tell us anything about when labor would start. The day passes with me not doing much: surfing the Internet, watching TV, calling my mother, sitting on the couch. It is now approaching 6pm and Dave decides to start supper. We are being lazy so he is just going to heat up a frozen pizza. I get off the couch and walk to the bathroom. As I am walking, I feel a strange sensation in my back, like a clunk. It is not painful, but it is noticeable as if something has dropped suddenly deep in the back of my pelvis. What just happened here? I continue to the bathroom not really expecting find anything unusual and I don’t. I sit down and empty my bladder for the hundredth time that day and then I realize: I’m hearing a trickle of something hit the water in the toilet and I know it isn’t urine. Did my water just break? Trickle, trickle. Yes, I think my water just broke. Now what? This wasn’t supposed to happen. The lady at the hospital class said that despite what we had seen on TV, it was very unusual for the first sign of labor to be ruptured waters. I was supposed to manage contractions at home until they were close enough together to merit a trip to the hospital. Nobody talked to me about what to do if my water broke first. All of my expectations and plans about when to go to the hospital just got thrown out the window. The pizza is in the oven and I go upstairs to call Labor and Delivery. I tell them I think my water has ruptured, but I am not sure. Am I was having contractions? No. Come into the hospital to be checked. Supper is in the oven. Can I eat first? No! Absolutely not! Come into the hospital to be checked. Can I take a shower first? Sure. I return downstairs to tell Dave what I was told and that he should go ahead and eat. I go back upstairs and get into the shower. I decide I am going to take a nice, long, hot shower because who knows when I am going to have the opportunity again. I stand in the water, enjoying it, and at some point start having contractions. They aren’t strong and I do not time them, but they have just enough sting to make me know it is real. The fluid keeps dripping out of me in trickles with each contraction. I ponder the feeling. I think about the date (the 27th) and the time of day (well after 6pm) and think the 28th would make a good birthday. It’s a nice even number and exactly ten days after my father’s birthday. Okay. I’m going to have a baby sometime tomorrow. After Dave eats, he comes upstairs and starts packing a bag for himself. My bag and the baby stuff are mostly ready to go, but after he finishes his bag, he wants to finish my packing too. As I stand in the shower, he brings items for my inspection for inclusion into the suitcase. I tell him I am having real contractions now. He gets very excited and wants to leave for the hospital as soon as possible. I am taking my time. I thoroughly shave my legs so I will not be self conscious at the hospital. While he is waiting for me to finish in the shower, Dave calls both sets of parents and other relatives to give them the update. My parents say they are going to wait to come until they hear more news. They are three hours away. Finally I shut the water off and get out. The contractions are coming regularly now, but still are not very strong and I am not timing them. I finish putting my bag together and we leave for the hospital. It is around 715. As we ride in the car, we decide now would probably be a good time to finalize our name choices. Grace Elizabeth if it’s a girl, which we suspect it is. Christopher John if it’s a boy, which I hope it is not because I don’t love our boy name. The contractions get more than noticeable, they start to hurt. I don’t know if I thought to time them here or not. Riding in a car with hard contractions is not fun. I have to stop talking and breathe through them now. It is only 15-20 minutes to the hospital, but I am ready to get out of the car long before we get there. I arrive at the nursing station and identify myself. I tell the nurse that I called earlier saying I wasn’t sure if my water had broken, but now I am sure and am having contractions and am definitely in labor. I have to stop in the middle of this conversation to have a contraction. The nurse says she has to check first before she will admit me and that I can’t be sure it is actually amniotic fluid. I’m pretty sure it is. She brings me to a room by myself for me to change into the hospital gown and asks me to hand her my underwear when I take it off so she can swab it and test for fluid. I tell her that I have on a pad. She looks annoyed and says, “How am I supposed to test it if it is absorbed in a pad?” I say, “I don’t know.” She leaves the room and I change. Wow, this is hard and awkward. My legs are throbbing and it hurts to move. I finally get changed, open the door, and hand her my pad. She scrunches her face and rubs something hard into the pad in an attempt to see if there is enough to test. “It definitely is amniotic fluid.” “I know.” She brings me to the triage room. “We need to check and see if you’ve made any progress.” I get on a table that is to the side of the nursing station and is only behind a curtain. I feel a bit exposed. I lie back and she checks my cervix. “3cm and 100% effaced so you are definitely ready to be admitted.” I feel a flush of excitement. This is really happening. Dave calls my parents and gives them an update. They still want to wait before leaving. I am brought to a room and told to get in the bed. The time is probably around 745. Immediately I am prepped with an IV and drip, an automatic blood pressure cuff, a contraction monitor belt, and a baby monitor belt. I feel completely strapped to the bed and trapped. I don’t know if the blood pressure cuff was defective or if my arm is just much smaller than most, but it continually had trouble picking up my readings and would squeeze my arm hard to the point of pain. I think I remember the nurses flipping the thing on and off a few times over the course of my labor, but I cannot swear it. All I know is that it is having trouble registering that my arm is there and continues to tighten as if it weren’t. I am having regular contractions, but if we timed them, I do not remember. I feel very uncomfortable lying in the bed. I cannot find a good spot to be. After a few minutes I broach the subject of why I have been strapped to the bed. I tell the nurse that I was told I would not have to stay in bed and that I could move during labor. She immediately counters by saying freer movement would have been allowed if my water had not broken, but since my water is broken, I must stay in the bed and be monitored at all times to keep the baby safe. “It isn't safe for you to move around.” I didn’t know enough to argue. I lean back in the bed, but am extremely uncomfortable. My back is hurting badly and all my weight is resting on my lower back. I squirm around trying to find a better spot. I am failing. I had read that contractions start in the low in the belly and then wrap around to the top. This is not what is happening to me. All the pain seems centered in my lower back and then is shooting down my legs. I ask the nurse when my back would stop hurting and when the pain from the contractions would move to my belly. She laughs lightly and says I must be having back labor and if my back is still hurting at this point, it probably isn’t going to stop. Oh. I continue to squirm and manage to roll myself in a ball. The contractions are coming one after another. The blood pressure cuff keeps trying to rip my arm off. Dave gets concerned and asks me if I need anything for the pain. The plan was for me to try to go as natural as possible. I didn’t want to be a hero, but I also wanted to manage on my own for as long as I could. 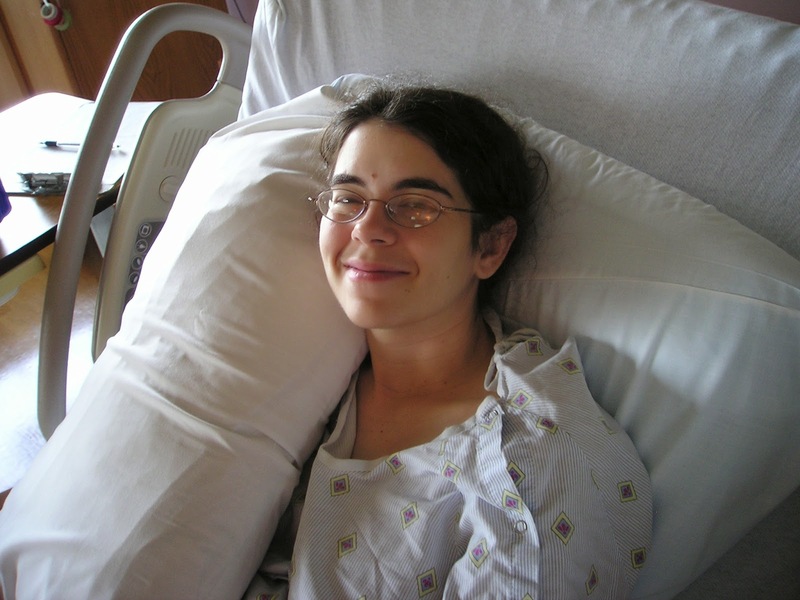 The plan was for me to move around during labor and find more comfortable positions to manage the pain. I am now strapped to a bed and in agony. I have been contracting for maybe an hour and a half. I know that I can expect to be in labor for another six, eight, ten hours. I have no idea how long this will last. All I know is that I cannot handle the pain I am currently experiencing for another eight hours. And this is early labor! It is going to get worse! I start to panic a little and find myself holding my breath. I ask the nurse what she might do for pain at this point in labor. She says that in early labor like this, they start out with a dose of Stadol which would take the edge off the pain. When labor had progressed far enough they would offer an epidural which would be complete pain relief. I was pretty sure I did not want an epidural, but something that would lessen the current pain I would consider. I am shocked at the level of pain. I had read that contractions would hurt, but there would be time for rest in between them. This is not happening here and I am not allowed to move to a position where the pain would be anything less than agony. After several more minutes pass with almost continual contractions, I tell her I want the Stadol. I am disappointed because in my mind I know I am walking down the road to an epidural, but I also know I cannot cope with this level of pain for eight more hours. The mantra in my mind is, “I cannot do this for eight hours.” In retrospect, I am clearly panicking. She doses the Stadol and pushes it into my IV. I immediately regret the decision. “Am I supposed to feel dizzy?” “Yes, that’s normal.” Oh. I hate feeling dizzy. She said it would take the edge off the pain. This is a lying lie from the black pit of hell. No pain relief at all, but all coherence is gone. I can barely keep myself upright. I slump back onto the bed which is agony. I cannot concentrate on anything but the searing pain. I assume there are breaks between the contractions, but I am not conscious of them. The blood pressure cuff keeps trying to rip my arm off. I writhe on the bed without the ability to think. I am constricted in my movements by all the devices attached to me, but that doesn’t matter anymore because I lack the coherence to move. The reason the nurses think Stadol takes the edge off the pain is because the patient can no longer form sentences to tell them it still hurts. There is nothing in my mind but pain. I can concentrate on nothing else. At some point I become aware that I am also having acid reflux. My acid reflux is terrible during pregnancy, but it really acts up when I am lying down or am hungry. Right now both apply. I haven’t eaten since lunch which was hours and hours ago and I am lying down in a drug-induced haze feeling wave after wave of contractions but unable to move. The acid is burning my throat. And so the time passes. I have no idea of what is going on around me or who is coming or going. I feel very alone. The room seems dark, but I know it wasn’t. At some point my parents call to say they are not going to wait any longer and are on their way. My brother also arrives and is in the waiting room with two friends. I am only vaguely aware of these things. After some amount of time, I become aware of the fact that I feel like I need to go to the bathroom. I despair. How am I going to tell them I need to go? How can I get up? I can hardly move! I can hardly speak! What is going to happen? Am I going to mess myself on the bed? This is horrible! I do not want to poop in bed! I am so embarrassed. How can I get to the bathroom? I lie there trying to figure out what to do and how to communicate the problem. All of a sudden a thought occurs to me. I give a little push. Immediately the pressure is relieved a bit. I don’t have to go to the bathroom? I don’t have to go to the bathroom!! That’s the baby’s head! Like a bell sounding, my head clears almost immediately, the room seems brighter, the contractions start spacing themselves and the agony is lessened. I think to myself that I need to tell someone what is happening. The time is 9pm. I do not want to sound like an idiot so I do not tell the nurse outright that I think I’m ready to push. I’ve only been at the hospital for an hour and a half and this is my first delivery. I gingerly gather my thoughts and say to the nurse, “I am feeling a lot of pressure now.” “Pressure?” “Yes, pressure like maybe I need to push.” The nurse looks at me very dismissively, “Do you want me to check and see if you have made any progress?” “Yes, I think so.” Again with a note of not exactly mockery, but more knowing that I could not possibly be anywhere near ready to push she says, “Well I’ll check you if you want me to.” She comes around to the foot of the bed and checks my cervix. Her eyes get wide. There is a flurry of activity in the room. Immediately I am told that the most important thing was for me to NOT PUSH! A nurse comes to my side and repeatedly tells me to breathe through the contractions. Breathe. Don’t push. The urge to push is overwhelming, but I try to do as I’m told. There are people coming and going now setting up equipment, but the nurse beside me never leaves. Don’t push. The pain of the contractions is less now and I feel like the agony has passed, but still I want to push. Don’t push. Every now and again, secretly, I indulge the urge and give a small, shallow push. It almost feels good. Not pleasant, but like the right thing to do. Don’t push. Breathe. Don’t push. I spend forty-five minutes suppressing the urge to push. Don’t push. Forty-five long minutes. I wonder when the doctor is ever going to arrive. Don’t push. Finally. She arrives. The nurses break down my bed. The doctor takes a seat at the foot of the bed. It is 945pm. The nurse explains how I am to hold my legs back in the air and then I will push while she counts to ten. She lifts my legs back and helps me put my arms around them. (An aside here—this is so absurd. Hard to believe this is the standard practice in hospitals.) She tells me to take a deep breath and PUSH! 1, 2, 3, 4, 5, 6, 7, 8, 9, 10. Relax. The baby didn’t budge, but the acid in my stomach shoots into my throat. Again. 1, 2, 3, 4, 5, 6, 7, 8, 9, 10. Relax. The counting annoys me. Baby is still not moving. My throat is burning. Again. 1, 2, 3, 4, 5, 6, 7, 8, 9, 10. I decide to ignore the counting nurse. I push when I want. She counts and I don’t push. She stops counting and I continue to push. Baby is still not descending. I am a bad pusher. After several tries, the nurse decides I need some other leverage in pushing apart from holding my legs. They bring a bar over my bed and wrap a towel around it for me to hold on to while pushing. The nurse will hold one leg and Dave will hold the other and I will pull on the towel while pushing. Counting again. Ignoring again, but I push hard while pulling on the towel. WHOA! Baby moved! That hurt! My throat burns. I pull back from the pain and it takes several contractions for me to gain the nerve to push that hard again. It is hard for me to decide which hurts more: the contractions or the acid. Right as I start to make progress pushing, the acid gets too intense and I have to stop. Between the contractions the doctor and I are making small talk about Hurricane Katrina which is bearing down on New Orleans. After several towel pull pushes, the baby is now descending. I only had to figure out how to use my muscles in the right way, but the stomach acid is unrelenting. The nurse decides I have done enough with the towel. She takes the bar away and becomes intent on making sure the fetal monitor can register the baby’s heartbeat. Since baby has descended, the monitor is not really picking up the heartbeat as well. The nurse presses the monitor into my abdomen. This is excruciating! I yelp in pain and tell her to stop. She says it is important to monitor the baby. For the rest of the labor, she stands there pressing into my belly trying to register every heartbeat she can. On the next contraction, she cuts and immediately the baby’s head pops out. The urge to push almost completely disappears and I have to wait on the next contraction to completely deliver. I am told the baby has a LOT of dark hair (Hello, heartburn.) It seems like several minutes pass, but I’m sure it was probably just one. The baby begins to fuss while the head is the only thing out. This amuses me greatly. What a sound! There is a real live baby coming out of ME! Finally the next contraction comes. I push and the baby is fully delivered. It’s a girl! Time of birth: 10:31pm. Total time of labor from rupture to birth: 4.5 hours. Wow! What the heck just happened here? Her birthday is on the 27th after all. They take Grace, who is vigorously crying, over to the ped nurse who has been waiting at a station behind my shoulders. While he assesses her and before I get to hold her, Dave’s cell phone rings. It is my cousin Gigi who lives nearby. She called for an update on the labor and is shocked to hear a baby crying. Dave tells her excitedly, “The baby was just born! She just came out! It’s a girl!” Gigi says, “Congratulations! Why did you pick up the phone?! Hang up and call me back later!” The nurse pronounces her a healthy baby and gives us her stats: 6lbs 6.9oz and 18in long. A little baby. My memory is less sharp here than during labor and my timeline is not as clear. I’m sure I held Grace soon after her birth, but I don’t really remember. I know I was not holding her when I deliver the placenta. 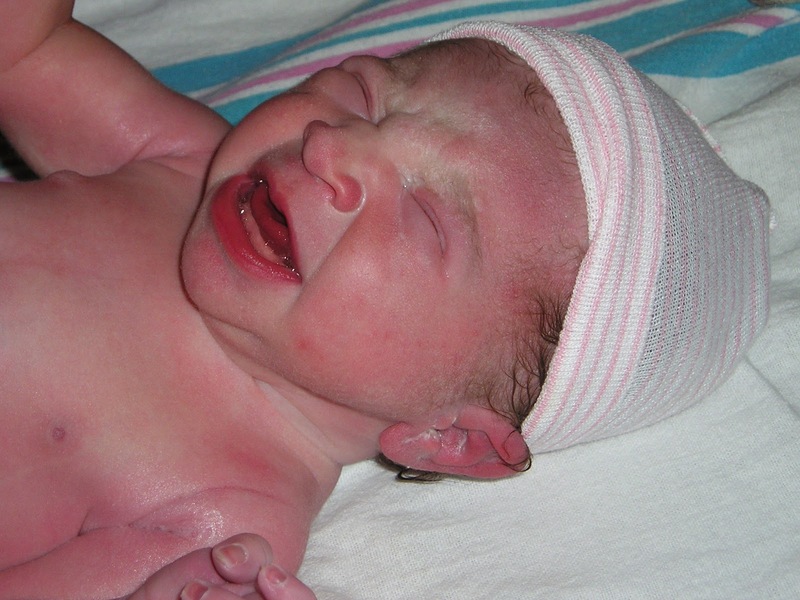 Delivering the placenta tends to be an afterthought in most birth literature. Nobody tells you how satisfying it is to deliver, but it is! Very satisfying, indeed. After the placenta was delivered, the doctor began assessing my laceration. While she prepped the site, the nurse leaned in and volunteered, “Is it a three?” The doctor answered, “No, we are going to call it a two.” I know who I believe and it ain’t the doctor. After I am stitched up, they hand me Grace. I am not overcome with emotion. I held her and thought, “Yep this is a baby.” I guess I was oddly disconnected, but I wasn’t concerned because I knew the hormones would kick in at some point and all would be well. I called my parents to give them the news. Daddy answers his cell phone and is surprised to hear a baby crying and that it is me on the phone. “I hear a baby crying!” They are still an hour away. Grace was fussy and I nursed her, but detached her so my brother and his friends could come in and visit. I was self-conscious about nursing in front of people. My parents eventually came and after all the hustle and bustle settled down, I discovered that I was still starving and still had blazing acid reflux. One problem: it’s now after midnight, the hospital kitchen is closed, all outside restaurants are closed and there is nothing to eat. I starved until 9 the next morning and got a Pepcid to tame the acid with that meal. It was a long night. I had never relished taking a pill more than when I took that Pepcid and then soon, sweet relief. As a result of that terrible reflux, the first thing I do now when labor begins is pop that little pill. I was wired most of the night (not to mention hungry with a burning throat). I maybe slept two or three hours the rest of the night. At some point in the night, the nurse came back into the room to enter information into my medical record. I asked her if she would consider the birth medicated or unmedicated since I had that dose of Stadol. She gave me such a bizarre answer. She didn’t really answer the question, but said she couldn’t believe how fast that Stadol worked to relax me and she had never seen it work so well to help with the labor. I looked at her and did not know what to say so I said nothing. She really thought my fast labor was due to Stadol, the devil drug. What do you say to that? I’d love to see the printout of my contractions showing full blown labor and transition which my professional medical team completely overlooked, but alas. So while at 4.5 hours of labor, Grace’s birth did not meet the technical requirements of a precipitous labor, it certainly hinted at the biggest concern for all my subsequent deliveries: How to avoid delivering on the side of the road. Aw, look at all that hair! I never had one with so much fuzz. Lucy had about that much hair. What a crazy experience. My water broke with my first two girls, but the labor was the opposite of precipitous. Interesting. My water broke with the first two, but my precipitous labor (well, not quite) was with the third. Back labor with the first two, also--and both were born looking up! With my first two, I was required to have pitocin because I wasn't progressing and the water had broken 12 or so hours previously. In both cases, I needed the epidural because of how the pitocin affected me--nothing gradual about it, and back labor on top of it. I did have an episiotomy for the first. He was 9lbs. 6 1/2 oz., and I was 20. I almost had a c-section. I figured that out because my eidural was too aggressive. It was a spinal. I also had issues pushing with him. I had a person on each side holding a leg and one bearing down on my belly from the top. I pushed for 15 minutes, when I was told to expect an hour of pushing, though. I did trust my doctor, who had delivered two of my siblings, but in some ways, I think she was covering her own liabilities with me. She had foreceps ready, which she fortunately did NOT have to use, and then there was the spinal block. I'm grateful for how everything turned out. I was young and pregnant, so I was REALLY underestimated, although women in childbirth are typically underestimated. And often mocked. I originally came here for the learning notes and now I keep checking back hoping for more birth stories! My first (and so far only) labor was about 6 hours and 15 minutes start to finish--and my water didn't break until about 5 hours in, for which fact I am very glad considering that I had terrible terrible back labor the whole time and I can only imagine it would have been a lot worse without that cushion. Now I keep teasing my husband that someday he is going to have to catch a baby in the living room, because we want a bunch of kids and labor supposedly gets faster every time. Oh, you want another story! :D I intended to write them all out eventually, but now you have given me incentive. I'll try to get baby #2 done sometime this week.